n.i.f.t.y c.r.a.f.t.y: Love you more than naps! Hi there! Happy Monday! Hope you all had a fantastic weekend. I’m back again with my third card for Newton’s Nook. 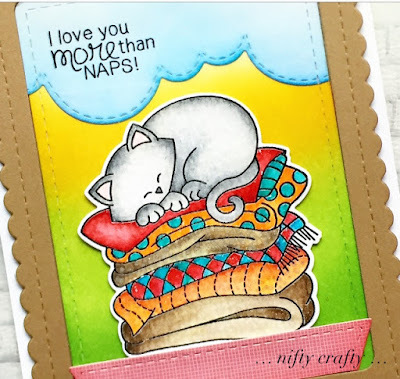 For this card, I used the Newston’s Naptime stamps set. This set is definitely an eye catcher! I’ve fell in love seeing him napping on top of the cozy blankets. He is too cute! I wanted him to be the focal point of my card. So I decided to use bright colors on the layers of blanket to make it pop. 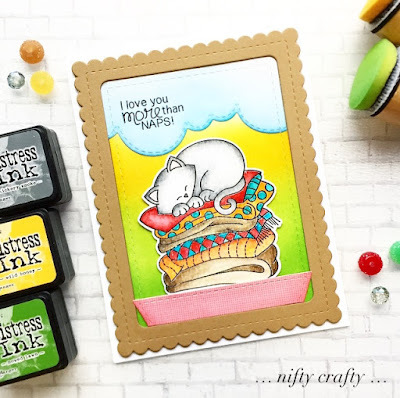 I stamped and colored the image using distress ink and die cut the image using the coordinating Newton’s Naptime die set. Next, I moved on to making the background. I wanted a contrast background for this card. So, I cut a stitched rectangle panel using Frames & Flags die set and inked it with Mowed Lawn and Wild Honey distress inks. Then, for the cloud I used the Stitched Cloud Border die set and inked it up with Salty Ocean distress ink. 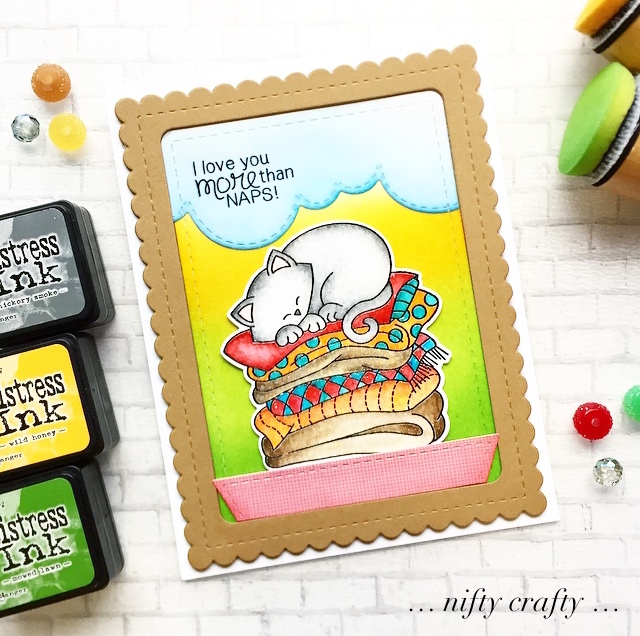 I stamped the sentiment on the cloud panel and heat embossed with clear embossing powder. I tried the inlaid die cutting technique to make a window with a little background scene for this card and it turned out great. I made the window frame using scalloped edge and stitched rectangle dies from Frames & Flags die set. Basically the negative part of this will be the frame. I made four frames and glued all of the layers together for added dimension. I inlaid the background panel to the center of the frame which I made earlier. Since the frame was made of four layers, it give a little depth to background and then I inserted a piece of acetate sheet on top of the frame layers to give the window a glassy look. Unfortunately, I couldn't capture it on my picture. I finished off the card by adhering Newton on the foreground. That’s all for today. I hope you enjoyed my card today.